It didn’t seem to be the biggest deal when we obtained tickets to see the Who in February 1981. Since Xmas we had been panning for the gold to be found on “Sandanista!”, a dense, sprawling triple LP on which the Clash laid claim to be the Greatest Rock & Roll Band in the World, a title previously contended by the, you know, Who. In January Elvis Costello’s lyrical dexterity & developing musical maturity delivered “Trust”, a 5 star collection (out of 5). In the same month David Byrne & Brian Eno were making music for a brave, future new world. “My Life in the Bush of Ghosts” would be influential & rarely equalled in the new decade. It was the shock & the shine of this new music that occupied our turntables. Those great Who records, whether filed alphabetically, chronologically or just left where they lie, tended to be at the back of the stack. The gig was at the Lewisham Odeon, one of the country’s largest cinemas, a stopping-point for the package tours of the 60s but now out of the loop & a little faded. The Who usually played enormodomes or sports stadia so this is better. The biggest gigs in the city, the Rainbow in Finsbury Park, the Hammersmith Odeon, both a fair trek from our South East London manor. Lewisham was a short bus ride from East Greenwich, a night out for the locals seemed to be in order. It was a 7.30 p.m. start, early after a day at work, we didn’t even have time to hit a pub just met up outside the cinema not quite ready to rock. I had picked up a half-bottle of whiskey (& rolled up a bit of the other) to help things along. Dave, good man that he is, had exactly the same idea. Sue, much cooler than us two, was sensibly not drinking for 2…more for us then. “Substitute”, “I Can’t Explain”, “Baba O’Riley”, a perfect triple whammy to start. The Who’s more recent output.may not have been the most vital but from their 1965 debut, the aforementioned “I Can’t Explain”, maximum R&B for smashed & blocked Mods, to 1973’s double LP “Quadrophenia”, the kids are not alright, they had been smack dab in the middle of British Rock’s amazing journey. “My Generation” (1965), a confident rebel yell, was one of those significant songs that convinced you that this Beat Boom was for real & not just a passing fad. In 1967 their 45 “Pictures of Lily” made my life so wonderful & then, at the end of the year, the LP “The Who Sell Out” was Pop Art, more relevant to 15 year old me than a Warhol print, an Antonioni movie or a novel by Truman Capote. As the band thundered into their set I realised that while the Who’s records may no longer be at the front of the stack, this group, well I used to follow them back in 65. A long list of great songs, my perfect Who set list, came to mind. This was going to be meaty, beaty, big &…you get me. So there was Pete Townshend, windmilling, power chord guitar hero, ambitious, a sensitive even neurotic songwriter, still a believer in the redemptive qualities of a great Rock & Roll anthem. Singer Roger Daltrey, the punk with the stutter who became a microphone twirling Rock God. His job was to sing Pete’s lyrics & he made damned sure that he would always have work. John “The Ox” Entwistle, stony faced & stood stock-still, rumbled a bass foundation & just how is he doing that ! Of course, Keith Moon, the group’s extraordinary drummer, had died in 1978. Kenney Jones, an ace Small Face, was an obvious, natural replacement but, well, y’know…Moon was a one-off, we knew that & I’m sure Kenney did too. We got 4 songs from the new, yet to be released, LP, that’s how it went in the early 1980s. I’d have to dig out “Face Dances” to remind myself how “Don’t Let Go the Coat” goes. “You Better You Bet”…I’ll be singing that for the rest of the day. Promotional requirements out of the way the band gave us more of what we had come for. Just the 1 track, the one about pinball, from “Tommy”, the expansive double LP which Pete was happy to call a “rock opera”, a presumption that I was never convinced by (it was still a great record). “Drowned”, “The Punk & the Godfather” & “5.15” were from 1973’s “Quadrophenia”, a more accomplished concept than the deaf, dumb & blind boy. 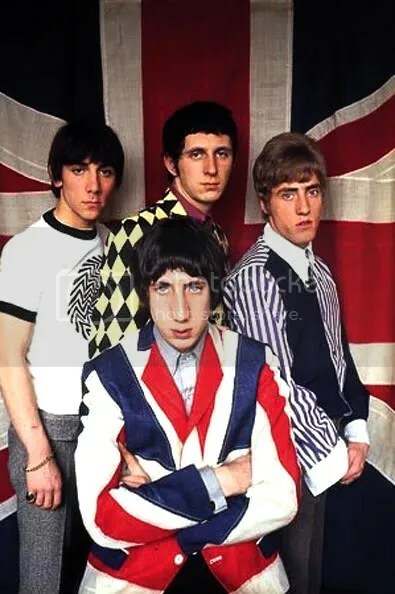 Townshend was better placed than anyone to document Mod, the most significant British youth movement of the previous decade. There’s a case to be made that Pete’s inability to satisfactorily complete “Lifehouse”,the one between these two big ideas, produced two of the group’s finest records. “Live at Leeds” (1970) may have been a stopgap release but captured the Who as an onstage juggernaut, It’s one of the great live LPs, the best ever according to Rolling Stone readers in 2012, & we were getting a taste of this tonight. “Who’s Next” (1971), with it’s innovative use of synthesizers, proved that Townshend’s pretensions to a wider cultural significance for his group were unnecessary when you were capable of making music as good as this. We got plenty of that one too. 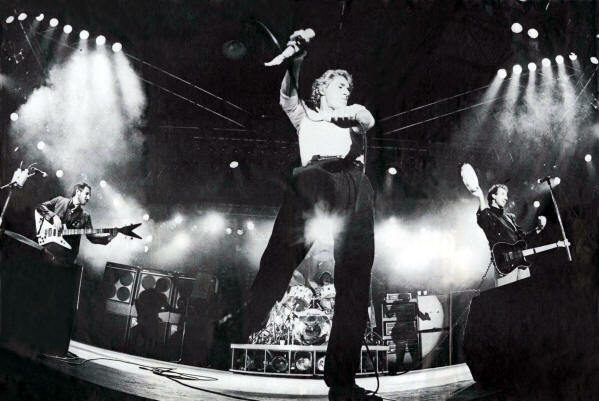 In 1981 the Who were still a working band, touring every year to promote new albums & consolidating their rep for putting on one of the great Rock shows. They were no longer smashing their equipment but the aggression was undimmed, the power unmatched. “Who Are You”, “5.15” & “Wont Get Fooled Again”, possibly a greater anthem than “My Generation”, were a world class ending to the set. They returned for an encore which included thunderous versions of “Summertime Blues” & “Twist & Shout”. I’m guessing that the PA had been scaled down to suit the venue but this was the loudest band I had ever heard. I had friends who still told of earlier ventures south of the river, great days out at the Charlton football & the Oval cricket grounds, when the Who had rocked over 50,000 people out of their socks. To see the group in such a relatively intimate venue was a privilege. You have got to love the Internets for allowing me to hear this concert again. If you stick with “Twist & Shout” to the end (& you should) you will hear a packed cinema going nuts in appreciation of just the best way to spend 2 hours on a Monday night in Lewisham. The next year the band toured the US with the Clash in support. Apart from showing out at Live Aid it would be 1989 before the next Who tour. By then the 20th anniversary of Pop’s resurgence had come around. VH1, MTV for old people, was launched, Golden Oldies were re-branded as Classic Rock & you could buy your record collection again, this time on shiny, new-fangled CDs. Original Who fans now had kids who were alright without babysitters, teenagers who were fans of the group themselves. The Who kept rolling out, even after the death of John Entwistle, to huge audiences, no longer promoting new music, easily filling long sets with their extensive back catalogue. In 2010 they were the half time attraction at the Superbowl.Pete & Roger played a 12 minute medley of songs that 100 million viewers knew because of some American cop show. Pete Townshend probably didn’t mean it when he wrote “I hope I die before I get old”, we have all said things as dumb as that. He’s 70 now, his group still sell out big venues playing 20 songs & every one a winner. I’m not sure that I want to be there but when I catch them on TV the Who seem to retain a strength & power that has always made them a class act. I was lucky to see them do their big show at a small place. Those stellar records (particularly the expanded “…Sell Out”), some of them 50 years old, are nearer the front of the stack nowadays too. OK, while we wait for the release, in early March, of “English Tapas”, the new LP by Sleaford Mods, February brought new records by two old favorites. Y’know, I possibly have enough music by Ryan Adams & Son Volt. From what I’ve heard, their current collections are not better than the stuff I already own. There’s the return of Clap Your Hands Say Yeah with only one surviving member of the group that made the notable debut in, (is this right ?) 2005. I’m more interested in “Backlash”, Black Joe Lewis & the Honeybears always had more going for them than Soul revivalism & the first record for 4 years will receive further investigation. Australian psych-gang King Gizzard & the Lizard Wizard have plans for 5 LPs this year, perhaps the fine “Flying Microtonal Banana” will not be the best of them. So, here’s a crazy video for a track from my favoured album this month. “Occult Architecture Vol 1” is the fourth LP by Moon Duo, the offshoot of San Francisco space-rockers Wooden Shjips. Guitarist Ripley Johnson’s hook up with keyboard player Sanae Yamada is proving to be more prolific than the mothershjip. The lo-fi, drone heavy sound of 2010’s “Escape” has developed into something that places them at the forefront of 21st century psychedelia. 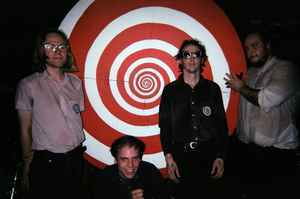 The signifiers are still there, the motorik steadiness, synthesized shades of Alan Vega, even Hawkwind’s guitar barrage (blimey !). 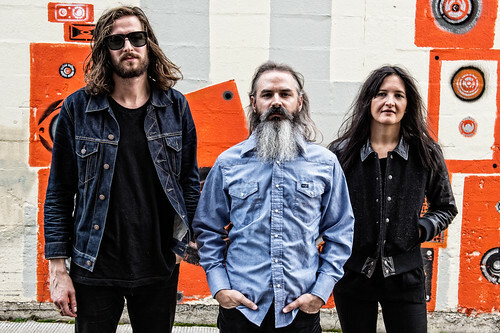 For all the cosmic cacophony there are tunes with hooks while more than a hint of the Garage about Moon Duo adds a power & drive that draws you in & carries you along to the relentless 10 minute closer “White Rose”. The video for “Cold Fear”, by Micah Buzan, is a strange & imaginative thing. Please don’t stare at the screen for too long if you are of a nervous disposition. The single of the month is “Who Made the Man” by the Minneapolis Uranium Club. It was released in October 2016 but, as I have stated before, this new music can take some time to get through to me. Now I’m no expert on hi-octane modern punk but I know a young person who is & he spent some of his student loan on this 7″ disc (Emmet ! You did what !). Further investigation has shown that there are similar groups who intend to have similar fun, fun, fun, until their daddies take their Devo albums away. I have also heard the Dead Kennedys & the Fall invoked, with a touch of Fred Schneider off of the B-52s in the vocals. This is all good. The other track, “Small Fry”, shorter & very 1977, is included in the clip & the LP “All of Them Naturals” will certainly be on the “to investigate” list. OK, enough of this new-fangled noise. 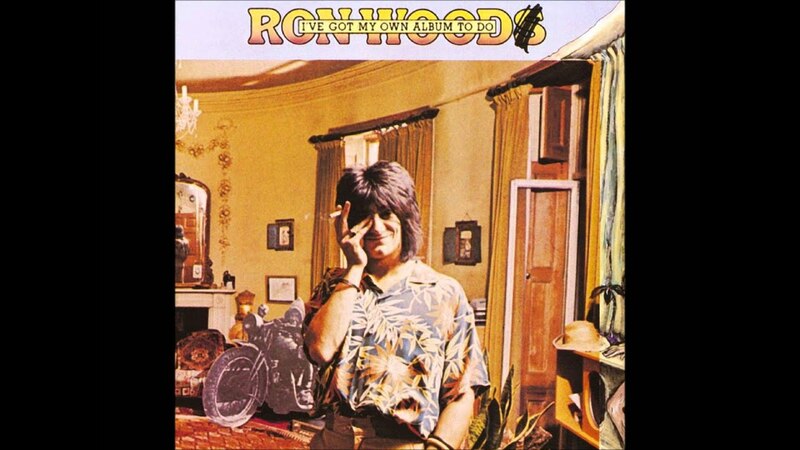 My album of the month is 1974’s “I’ve Got My Own Album to Do” by Ronnie Wood. Back then Ronnie was doing very well thank you after a spell as bassist in the Jeff Beck Group & as guitarist in Faces, a band popular enough to tour the world in their own right but increasingly in the shadow of the solo success of their singer Rod Stewart. Original Face Ronnie Lane had already left the group & Ronnie W could hear the way the wind was whistling (1973’s “Ooh La La” became their final LP). He lived in a very nice part of West London, Richmond, near the park, in a well-appointed gaff, The Wick, overlooking the Thames, which he had bought from actor Sir John Mills. The basement became a studio/man-cave & he invited Rolling Stone Mick Taylor over to help with that album that he had to do. The Wick had a coach house in the garden (very nice) & Keith Richards off of the Rolling Stones, at a loose end with no touring for his band that year, came over & stayed to help things along &, quite possibly, have a real good time. More of Ronnie’s heavy friends appeared. Track 1, the joyous, loping, funky “I Can Feel the Fire” has that Mick Jagger (& David Bowie) on backing vocals while the next one up, “Far East Man” is a collaboration with George Harrison. 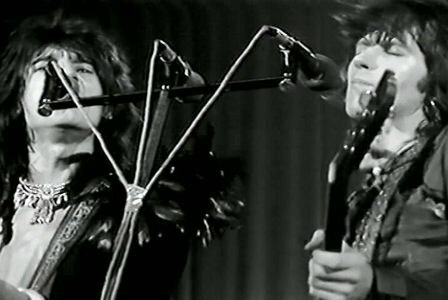 Jagger/Richards (maybe just the latter) gave Ronnie 2 songs, “Sure the One You Need” is good enough for them to have possibly regretted it. “Mystifies Me”, a great original soul ballad, reunites the unit which made Rod’s “Every Picture Tells a Story” such a stand out. The rest of the album features the American rhythm section, Andy Newmark (drums) & Willie Weeks (bass) who were as good as it got back then. There are 2 Soul covers included, Freddie Scott’s “Am I Grooving You”, a classic produced & co-written by Bert Berns, & Freddie & the Dreamers’, no, make that James Ray’s, “If You Gotta Make a Fool of Somebody”. To promote this all-star album, there was not always room in the basement for everyone who showed out, Ronnie played 2 shows in July 1974 at the Kilburn State in North London. Along with Ronnie, Keef, Weeks & Newmark are Faces Ian McLagan (organ) & Rod Stewart (backing vocals). Now “I’ve Got…” is a terrific record, a super session where egos were left at the studio door, but the superb live show (see it here) is, for anyone interested in British music of the time, Rock & Roll Heaven. Mick Taylor, who played on 5 tracks on the LP is not around & by the end of the year had quit his day job with the Stones. There was a prolonged search for a replacement but Ronnie, who released another LP in 1975, helped out on a Stones tour before joining permanently, sure was the one they needed. In late 1969 I watched the first TV series of “Monty Python’s Flying Circus” with my Mum. Dad was more vocal about things he disapproved of on the idiot box. “Top of the Pops” was never not interrupted by “I can’t hear the words” & “Is that a boy or a girl ?”. While I struggled not to fall off the sofa in convulsions of laughter Mum’s silence was only interrupted by regular tutting. That was OK, an example of the “generation gap”. I was 17, living in the swingingest country in a dynamic decade, Mum was ancient…36 ! Anyway, don’t you hate it when old people think they are down with the kids ? As my sides were splitting over Bicycle Repair Man, Nudge Nudge & Arthur “Two Sheds” Jackson, Mum was wondering quite what the world was coming to. Monty Python is now regarded as a high watermark in comedy (not just British), a ground-breaking New Wave of hilarity. My friends & I had an interest in any seriously funny business & the series was a much anticipated collision of talents who had already been making us laugh for some time. Despite the increasing hegemony of television the BBC, the monopoly provider of UK radio, continued to commission popular comedy programmes. I was too young for “The Goon Show” but Spike Milligan’s anarchic tomfoolery was built to last & still around. The interest in political satire, sparked by the decrepit Tory government of Harold Macmillan, had been past my bedtime but Peter Cook & Dudley Moore seemed to be the funniest men in Britain. They had come to notice in “Beyond the Fringe”, a tremendous success, a merging of the best talent from Oxford & Cambridge university revues. Comedy became a career option for graduates of these establishments & the Beeb eagerly signed up the next generation of side-splitting scholars. When the 2nd series of “I’m Sorry I’ll Read That Again” moved to the Light Programme from the Home Service (I know…what the…!!) in 1965 it soon became essential listening.Satire was played out, we had a new Labour government, the first for 15 years, & it wasn’t only comedians who were cutting them some slack. The young cast of “I.S.I.R.T.A” reverted to their teenage Goonery & spliced it to the iconoclasm that Britain was getting pretty good at in the mid-1960s. The new rules were that there were no rules &, often, no punchlines. In the helter skelter of hilarity the stand out was John “Otto” Cleese. His parody of the oleaginous “bubonic plagiarist” (©P. Cook) David Frost nails the vacuity of the chat show format. Frost was not the last self-obsessed, talking loud saying nothing, TV host to prosper in the US. It was on the BBC’s “The Frost Report” that we first got to see the 6’5″ Cleese in our telly. 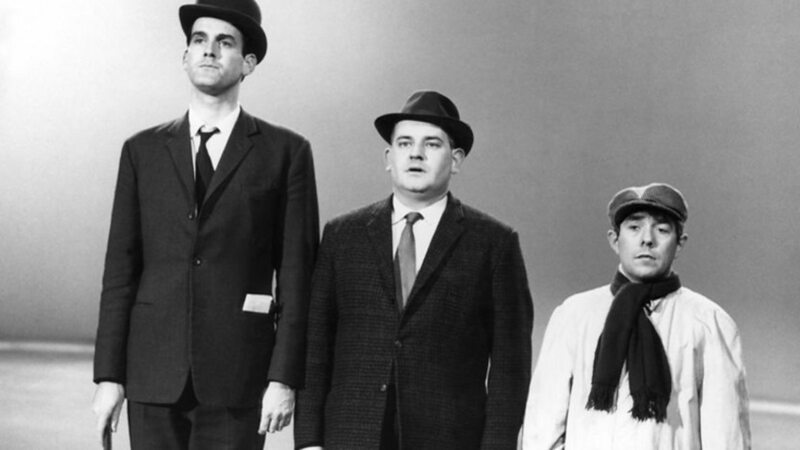 Sketches with, in descending order of height, Cleese & the two Ronnies, Barker & Corbett were the stand out in a successful series. 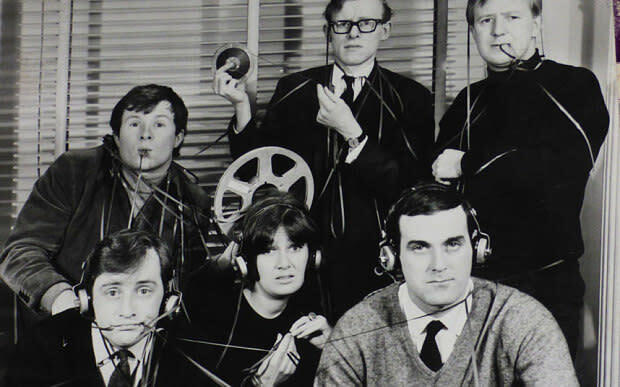 Frost’s production company (he was always a busy…) assembled Cleese, his writing partner Graham Chapman &, from “I.S.I.R.T.A”, Tim Brooke-Taylor for 1967’s “At Last the 1948 Show”, a mix which included older university revue stuff & sketches which would later be used by Python. The cast was completed by the “lovely” Aimi McDonald (& she was) & Marty Feldman who had a reputation as a writer, for Frost & “Round the Horne”, a very popular radio series, not as a performer. Marty had much more going on than the bulging exophthalmic eyes that gave him a face for comedy. He roughened the intellectual edges of the others & brought along his own brand of mischievous anarchy. The ramshackle improvisation & corpsing in this cross-dressing cop sketch still makes me laugh out loud. “…the 1948 Show” replaced “Ready Steady Go” as the must-see TV show, another night that I was on my quiet, best behaviour so that bedtime came a little later. Meanwhile at teatime, children’s TV was getting more interesting. “Do Not Adjust Your Set” ran for 2 series from December 1967 to May 1969. Eric Idle (Cambridge), Terry Jones & Michael Palin (both Oxford) were touting their sketches around to the successful comedy shows already mentioned & were enthusiastic about writing & performing their own show. They were joined by Denise Coffey & David Jason ( as not-so-superhero Captain Fantastic), later to find his own place in the British comedy pantheon. Neither lampooning the worthy but patronising tropes of British children’s TV (& about time too) nor being funnier than other comedy for kids was particularly difficult but “Do Not…” did both with imagination & energy. It was an opportunity for the 3 young writers to find out what worked & what didn’t. I was of an age where kids’ TV was no longer interesting but this was a reason to rush home from football practice, ask my sister & 3 brothers to move on over & let me watch my show.Then we all had to hush up while Dad watched the News ! For the musical interludes, direct from “Magical Mystery Tour”, the Bonzo Dog Doo Dah Band were now sending up their novelty trad jazz roots, dropping the Doo Dah & becoming the funniest rock group on vinyl. A regular TV slot & a free rein allowed them to develop their visual style & expand their audience. By the end of 1968 “I’m the Urban Spaceman” was in the UK Top 5 & we were rolling around to the classic LP “The Doughnut in Granny’s Greenhouse”. In the second series the guy who contributed short illustrative inserts, Terry Gilliam, a young American, was given more to do. “Beware of the Elephants” (with the UK’s most prominent racist, Enoch Powell, promoting sludge that keeps everything “white, white, white”) is perfectly Pythonesque. We all know now that the world is a better place for having Gilliam around. “Monty Python’s Flying Circus” was not something completely different for us 16 year olds who liked to laugh. It was a merger of talents who had been making us do that very thing for some time & was eagerly anticipated. I guess that we thought that this new troupe would attract a cult following (that would be me) before the BBC decided that it was just too silly & pulled the plug. It really did not take long (Episode 8, the Dead Parrot sketch, Ep 9 the Lumberjack Song) before British youth were committing this funny business to memory & knowing that it was built to last.20 years later, on a quiet Mayfair street, on a quieter Sunday morning, I met John Cleese & he politely acknowledged my rather effusive greeting. I didn’t ask him to do a Silly Walk or perform the Gunfight at the OK Corral in Morse Code, just paid the respect & thanks due to a Comedy Don.